Freedom Mortgage Corporation is a privately held, full-service mortgage lender that provides loans to clients nationwide. The company was founded in 1990 and its current headquarters are in Mount Laurel, New Jersey. As you may have guessed by its name, Freedom Mortgage’s central focus is on mortgages. While home loans make up a significant portion of its loan operations, the company also offers loan servicing and refinancing through its wholesale, correspondent, commercial and retail divisions. Freedom Mortgage prides itself on its streamlined process and its belief “in offering you the ability to own a home and use your home for living better.” The company has grown one customer and one loan at a time. According to Consumer Finance Protection Bureau (CFPB) data, in 2015 Freedom Mortgage had a total loan volume of $20.6 billion. The company itself has grown as well: After starting with just a handful of employees, Freedom Mortgage now has over 2,500 employees. Does Freedom Mortgage Operate in My Area? Freedom Mortgage offers loans in all 50 states, the District of Columbia, Puerto Rico and the Virgin Islands. What Kind of Mortgage Can I Get With Freedom Mortgage? Fixed-rate mortgage: These loans have set interest rates throughout the loan period, meaning market fluctuations will not affect the rate you pay over the course of the loan. Fixed-rate mortgages are the most popular home loan option. If you plan to stay in your home long term, a fixed rate mortgage may be your best bet. Borrowers can opt for a 15-year or 30-year loan with Freedom Mortgage. Adjustable-rate mortgage (ARM): The interest rates on these are subject to changes based on market fluctuations. Although ARMs have maximum interest caps, the fluctuation makes them a less stable option for borrowers. Adjustable-rate mortgages typically offer lower initial interest rates than fixed-rate mortgages do. The introductory period can vary from one, three, five or seven years, depending on the loan’s terms. For those who don’t necessarily plan to be in their new home for the long haul, this mortgage option might be a good solution. Federal Housing Administration (FHA) loan: These mortgages are insured by the government and are for those who don’t meet the requirements for a conventional loan. If you don’t have a high income, a significant amount of savings or a high credit score, an FHA loan might be ideal for you. With this type of mortgage, you may be able to pay as little as 3.5% in down payment. Your closing costs may also be lower with this option and your debt-to-income ratio can be less-than-perfect for an FHA loan. Veterans Affairs (VA) loan: Freedom Mortgage is a VA-approved lender with more than 25 years of experience with these loans. VA loans offer added benefits and support to military veterans, active and reserve military members, National Guard members and eligible surviving spouses in the form of no required down payment, no private mortgage insurance costs and no pre-payment penalties. The Department of Veterans Affairs backs these loans. Refinance: Sometimes borrowers choose to refinance a current mortgage to lessen a monthly payment or to take advantage of a lower interest rate. Or, you can refinance to gain access to cash to pay other debt. Your options with Freedom mortgage range from conventional refinances, to streamline government-backed refinances such as VA, USDA or FHA. Learn more about your options from one of Freedom’s loan officers. What Can You Do Online With Freedom Mortgage? You can learn about your loan options on Freedom Mortgage’s site. There are educational resources that help you understand terms associated with mortgages as well as comprehensive guides, such as how to understand your credit score. You can also find an application checklist, moving checklist and a thorough explanation of the closing process. While the educational resources are helpful, you can’t start the loan application process through the site. You can’t get an online login until you have a loan number, which means you already have a mortgage. The online features (and mobile app) are used to make payments and for you to track your loan balance. To get things started, you have to call a representative or find a loan officer in your area. Luckily, the site offers a portal so that you can search for someone in your area. However, if there isn’t a representative near you, you’ll do everything via telephone. It’s a downside if you were hoping to apply in-person. Would You Qualify for a Mortgage From Freedom Mortgage? Freedom Mortgage will analyze multiple financial factors when you apply for a loan. First things first: your credit score. It can vary between lenders, but usually if you have a 600 FICO credit score or below, you’ll require a government-backed loan such as USDA or FHA because you’re deemed a higher risk lender. Conventional loans generally require a good credit score, usually around 700 or higher. Most lenders urge you to check your credit score prior to applying for a loan so that you aren’t surprised by the results. Other financial factors Freedom Mortgage will consider include: down payment savings, your income and your current debt. If you’re hoping to qualify for a conventional loan, you generally need a down payment of 20% of the cost of the home. Anything less than 20% usually requires private mortgage insurance (PMI). For government-backed loans that advertise low down payment requirements, such as FHA loans, you will have to pay mortgage insurance premiums (MIP). Similar to PMI, MIPs help guarantee that the lender won’t lose as much money if you default on the loan. As for current debt and income, lenders will look at something called debt-to-income ratio. This helps lenders determine whether you have enough cash to pay your potential monthly mortgage bill. You can even do the math yourself. First, you take your monthly debt payments which can include anything from credit card debt to student loans, add them together and then divide by your pre-tax monthly income. This can be tricky if you don’t have a regular salary job (for example if you’re a freelancer), but make your best estimate for monthly income. To illustrate, let’s look at an example. If your salary is $45,000 a year, you make roughly $3,750 a month pre-tax (divide by 12 to get your monthly income). Now let’s say each month you pay $200 for student loans and $350 each month for a car payment. Your total monthly debt payment is $550. Next, divide $550 by your monthly income, $3,750. You’ll get 0.1466 which you multiple by 100 to find your percentage: 14.6%. That number is your debt-to-income ratio. You don’t include things such as rent payment or groceries, just actual loans/debt. So if you have another mortgage, you’ll need to add that in. The percentage is important because it helps a lender determine how much money you have available to pay for a mortgage. The rule of thumb for many lenders is to accept a maximum debt-to-income ratio of 43%. However, that’s on the high end and usually won’t be low enough to qualify you for a conventional loan. Generally, you want to aim for a debt-to-income below 30%. 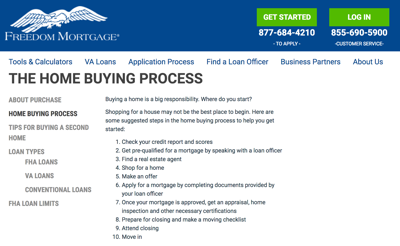 What’s the Process for Getting a Mortgage With Freedom Mortgage? Freedom Mortgage urges you to check your credit report and speak with a loan officer to inquire about pre-qualification before searching for homes. That way, you can get an idea of how much home you can afford before searching. You can find a detailed application checklist on the website that’ll help you gather and prepare all the necessary information and documents. It’s useful to gather the information prior to your conversation with a loan officer, as it will help speed the process. Once the loan officer reviews your financial situation and pre-qualifies you, you can start making offers on homes. After you’ve found the home you want, you’ll apply for the actual loan. The application process is usually more complex than pre-qualification, meaning you’ll need to provide supporting documents and spend time reading over and signing paperwork to set the process in motion. Some of the documents you may have to provide include pay stubs, tax returns and recent bank account statements. Once the seller accepts your offer and you’ve received approval on the loan, you will be ready for closing. This is the final stop along the road to homeownership. However, an appraisal may be necessary if you choose an FHA or VA loan. An FHA or VA appraiser may need to inspect the property to ensure it meets all necessary standards. Once it passes the appraisal, you can move to the final step: closing. During the closing process, you’ll be reviewing and signing paperwork. It depends on the lender, but usually there will be a title company representative, a closing agent and your real estate agent. Freedom Mortgage offers a helpful closing guide. It details what documents you’re required to sign as well as explanations for each closing cost you’re potentially responsible for. Closing costs are fees paid during the closing of a loan. Examples include homeowner association fees, owner’s title insurance, attorney fees, prepaid interest and recording fees. The closing agent should be able to answer any questions or concerns you have during your review of the documents, but it’s always helpful to do your research beforehand. Luckily, Freedom Mortgage offers clear information on its site. Starting from humble beginnings, Freedom Mortgage has proven itself a contender in the mortgage market. The company has depth of experience with government-insured mortgage programs — FHA, VA and USDA — which is helpful for the millions who don’t qualify for conventional loans. 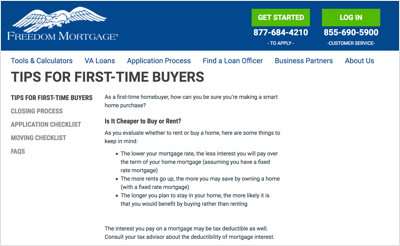 In 2014, the Loan Production Office of the U.S. Department of Veterans Affairs ranked Freedom Mortgage as number three in the top 50 VA lenders, with $5.6 billion originated mortgages between October 2012 and June 2013. It is worth noting that in 2016, Freedom Mortgage agreed to a $113 million settlement to resolve allegations regarding violations of the False Claims Act. During the housing market bubble between 2006 - 2011, Freedom Mortgage certified mortgage loans for FHA insurance that did not meet Housing and Urban Development (HUD) underwriting requirements. As for customer support, information is easy to find on Freedom Mortgage’s simple site, which can be an indicator that the company cares about its customers. However, the site does lack some capabilities including online loan applications and pre-qualifications. If you don’t want to spend time on the phone or in-person, you may benefit from a different lender that has more advanced online offerings, such as Rocket Mortgage. Freedom Mortgage has loan officers in all 50 states as well as the District of Columbia, Puerto Rico and the Virgin Islands, which makes the company widely available. However, a downside for those who like to bundle is that the company only offers loans, no other banking or financial services. The good news is that Freedom Mortgage offers a wide variety of loan options, including multiple types of refinances and mortgages. How long you're planning on living in a home can be an extremely important deciding factor in what type of mortgage you should apply for. For example, those who anticipate staying in their home for many years will likely find it better to go for a fixed-rate mortgage, as they're very reliable. On the other hand, if you think you may be moving within a few years, an adjustable-rate mortgage (ARM) is likely the better choice. A financial advisor could be a welcome, albeit unexpected, addition to your family financial situation. This is especially true for those in the process of applying for a mortgage, as it can cause a lot of financial stress. If you're interested in getting set up with up to three advisors in your area, take a look at the SmartAsset financial advisor matching tool.